When it comes to boat detailing here in San Diego, our technicians at 5 Point Auto Spa are experts. Living in Southern California, we are lucky enough to enjoy the beautiful sunshine and warm weather for most of the year and be close to the water. If you are lucky enough to own a boat, there is nothing better than being out on the water on a warm sunny day with friends. Unfortunately, maintenance for your boat isn’t always as enjoyable as spending time on it. Luckily for you, our technicians at 5 Point Auto Spa are professionals when it comes to boat detailing. Let our friendly staff take care of all your boat detailing needs. Leaving your boat in the dock, barnacles, algae, saltwater and fishing debris can attach to the bottom of your vessel making it difficult to clean. Adding Ceramic Pro Marine to your boat will provide a layer of protection to your boat making it a breeze to clean and keeping maintenance at an all time low. 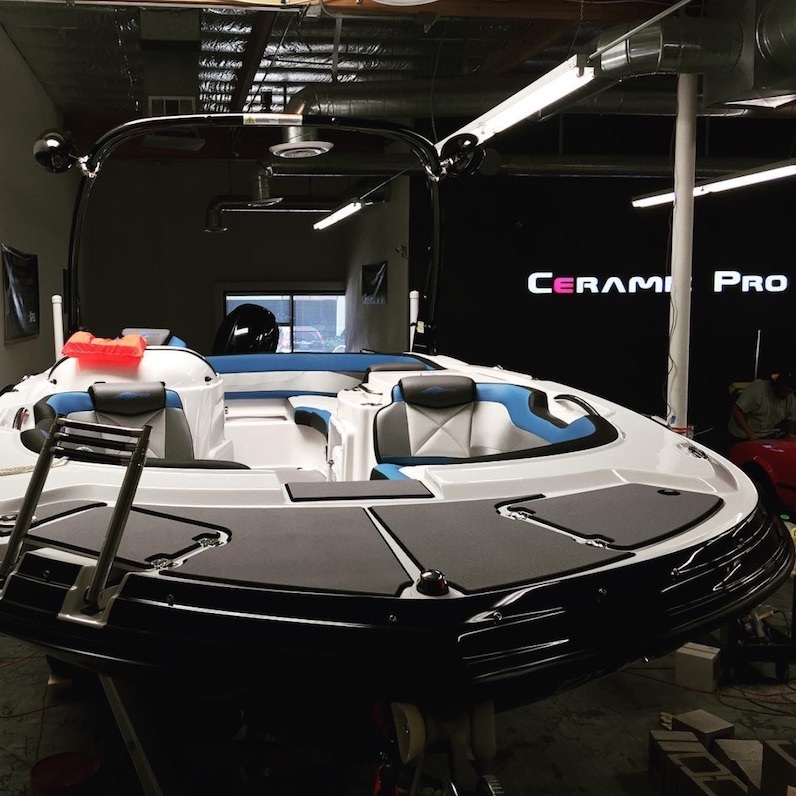 When it comes to Ceramic Pro, our technicians are all certified experts at installing Ceramic Pro and understand the importance of paint protection for your vessel. Ceramic Pro Marine uses nanotechnology to add a ceramic coating to your boat to keep it protected from the barnacles and sea creatures that can damage your boat. It adds a hydrophobic layer to your paint that gives it a slick finish and preserves the paint. Whether you have a fishing boat, a yacht, a jet ski or another marine vessel, adding Ceramic Pro Marine is an excellent way to preserve its value and keep it looking its best while cutting maintenance back ten fold. Ceramic Pro Marine was designed specifically for protect all surfaces of your boat. Save thousands on aftercare products when you get our Ceramic Pro Marine package. We’ll see you out on the water. Ceramic Pro Marine will add a glossy coat finish to your vessel that will give it added shine. The Ceramic Pro Marine exceeds OEM standards, so your boat will look better than new after getting coated. Ceramic Pro Marine is the most durable paint coating available for your vessel. It will withstand the most extreme hazards from the ocean. It will protect your boat even in the most extreme environments. If you’ve been thinking about adding durable protection to your vessel, Ceramic Pro Marine is right for you. When it comes to versatility, Ceramic Pro Marine is the most adaptable functional product out on the market. It will protect every surface area of your boat while serving other functionalities. All of our Ceramic Pro Marine coatings come with a “peace of mind” warranty because we believe your experience should be just as good down the road as it is the day you came to us. The Ceramic Pro Marine product uses state of the art technology to protect your vessel from the harshest UV sun rays keeping your boat in the best condition. Ceramic Pro Marine helps prevent algae and other plants and barnacles attaching to your vessels surface. It makes cleaning your boat a breeze and means no more acid stains on your beloved vessel. Ceramic Pro Marine will protect your vessel from oxidation. It layers onto the surfaces of your vessel building a protective layer that keeps the exterior of your boat protected from oxidation. Adding Ceramic Pro Marines to your boat will give is a protective coating that makes bird and bug droppings, fish blood, oil and other elements from the ocean slide right off the exterior and be easily washed. After receiving the Ceramic Pro Marine package, washing your vessel will be as breezy as the ocean air.